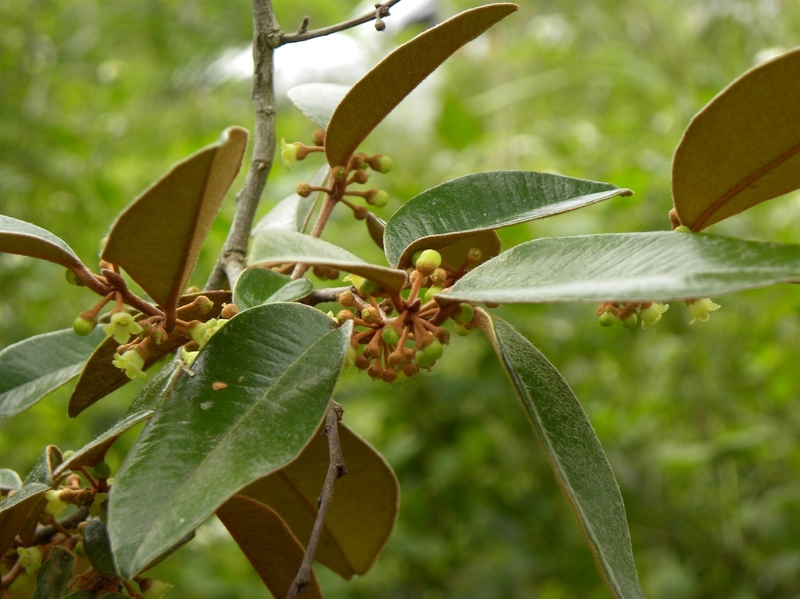 Habit: Chrysophyllum oliviforme grows as a medium to large tree up to 17 meters in height. The leaves are arranged alternately, to 10 cm in length, ovate with an acuminate leaf apex and entire margin. The adaxial surface is dark green and glabrous and the abaxial surface is covered with brown tomentose pubescence. The actinomorphic flowers are arranged in groups of 2-9, arising in the axils of leaves. The calyx has 5 unfused brown pubescent sepals. The corolla has 5 white fused petals. There are 5 stamens fused to the corolla. The ovary is superior with 5 locules and numerous seeds. The fruit is a purple/black berry at maturity. Habitat: Chrysophyllum oliviforme grows in Dry Broadleaf Evergreen Formation – Forest/Woodland/Shrublands (coppice and scrublands). Distribution in Bahamas/Globally: Chrysophyllum oliviforme grows in the central and northern Bahamian islands but also in the extreme south (Turks and Caicos Islands), as well as Florida and the Greater Antilles. It is also found in Honduras and is now cultivated around the world. Medicinal/Cultural/Economic usage: Chrysophyllum oliviforme is used in the Bahamas to treat circulatory problems. Chrysophyllum oliviforme is used in the horticultural industry for the interesting contrast between the adaxial and abaxial leaf surfaces.